We served asparagus along with Roast Leg of Lamb  and Quinoa and Squash Gratin  for a dinner party this weekend. Trim asparagus ends and peel off any large leaves on the stalks. Boil water in a tea kettle. 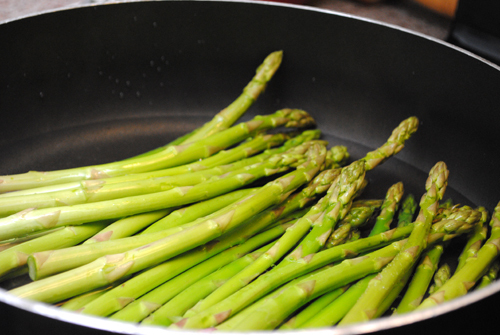 Place one layer asparagus in a large skillet over medium heat, and pour boiling water over spears. Cook in batches if necessary as to not stack the asparagus. Boil asparagus for 1 to 2 minutes or until just tender but still with a crisp. Transfer asparagus to a large mixing bowl and add butter and salt. Mix with tongs, butter will melt and coat the spears. Place 5 to 8 spears on each plate and serve immediately.